When I was a kid, we used to have couple of books and audio plays on LPs. I clearly remember some 'Winnetou' by Karl May, 'Die Kleine Hexe' by Ottfried Preussler and 'Hui Buh'. I'm pretty sure it drove our parents to madness, but I loved them and it basically guarentied an hour of quietness from my side. Today, being a bit more grown up, I have learned to love audibooks. I started out with 'Lord of the Rings' and the Harry Potter series (with both Jim Dale and Stephen Fry as readers) but am not adversed to other authors (i.e. Bill Bryson, Harry Dresden, Rick Riordan, ...). Audiobooks work great when driving long distances but I also listen to them while knitting or doing cross-stitch. The current book I'm listening to is 'The Name of The Wind' by Patrick Rothfuss. One of the reasons I picked it up was because one of my favorite voice actors - Nick Podehl - is reading it. I listened to him reading the 'Foundation' Trilogy by Mercedes Lackey (one of my favorite authors ever) a while back and when I was looking for a new audiobook I found 'The Name of the Wind' also read by him. The story seemed interesting, the reviews were good, so I picked it up. It's 28 hours long and I've listened to at least an hour every day for the last two weeks. Nick is doing a fantastic job with the different voices and dialects. I'm getting near the end of the book and I'm happy to know that there second book in the series - 'A Wise Man's Fear' - is already out and that it's even longer than TNotW: 42hr 59min. This should keep me listening for a while. 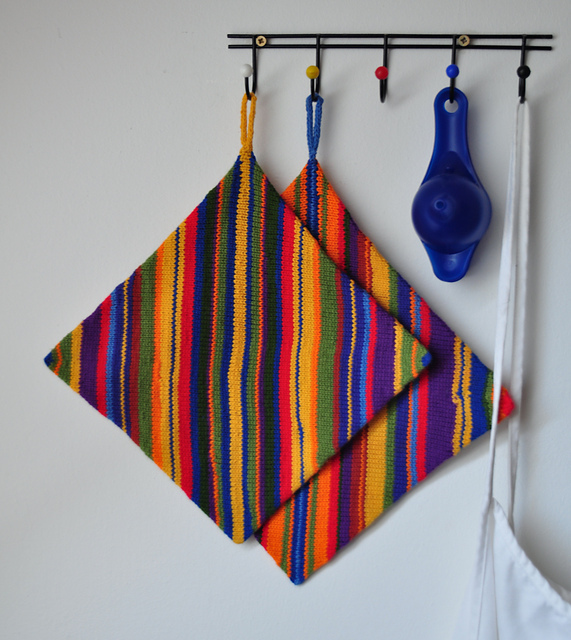 I've made potholders. Still working on optimizing the jogless stripes. Inside are pears, a bit of cocoa and loads of whipped cream, between two layers of bisquit. If I may say so myself, it was really yummy!